Rides through and around the Black Hills during the Sturgis® Motorcycle Rally™ are world famous for their routes and scenic views of the beautiful Black Hills. Hog Heaven reminds riders to watch the weather and be prepared for rapidly changing conditions. Hail, wind, and heavy downpours aren’t uncommon in August, and in past Sturgis Rallies many riders have been caught in severe weather. Spearfish Canyon is a must-see for visitors to the Sturgis® Motorcycle Rally™. The canyon is a premier destination in the northern hills and riders will have the opportunity to see Bridal Veil Falls, Spearfish Falls, Little Crow Peak, the former Homestake Gold Mine, Black Hills Mining Museum, and much more. If you start in Spearfish, you’ll travel 20 miles up Hwy 14 through Spearfish Canyon to Cheyenne Crossing, which is a convenient stop for refreshments and rest. Returning, consider traveling the 20 miles on Hwy 85 from Cheyenne Crossing, through Lead and Deadwood, and back to Sturgis, Rapid City, or Spearfish. Starting in Sturgis, a ride to two monuments that capture the majesty of South Dakota - Mount Rushmore National Memorial and Crazy Horse Memorial – is a big day, but one that is a Sturgis Rally favorite. Travel from Sturgis to Rapid City and from there you’ll travel Hwy 16 to the hills’ monuments. The 140-mile round trip will have plenty of gas, food, and entertainment stops along the way. From Sturgis, there is no more scenic route to Rapid City than through Vanocker Canyon to Nemo, and following Nemo Road into Rapid City. The 40-mile trip features some of the best Black Hills views and offers riders winding roads and gentle slopes. 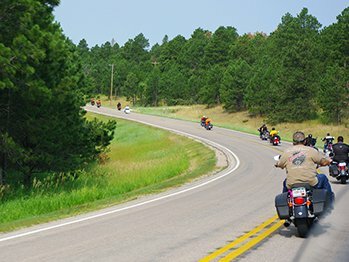 As with all routes during the Sturgis® Motorcycle Rally™, Vanocker Canyon and Nemo Road are busy and times may be longer than expected, but when you arrive at your destination in Rapid City you’ll find plenty of entertainment and eating establishments to rest and enjoy the South Dakota sunshine. Sturgis to Devils Tower National Monument is a relatively short ride, but will consist of more highway miles than most Black Hills routes. Still, the 90-minute ride is well-rewarded when you near the national monument on Wyoming’s Hwy 24 and Devils Tower rises from the landscape. Truly a magnificent sight, Devils Tower is only more impressive from the base, where you can walk around the butte. Take Interstate 90 east to Wyoming Hwy 14 and follow the signage. Returning to Sturgis on Hwy 24 through Hulette will offer a wonderful look at Wyoming’s mountains and natural landscapes. This is one of the most popular rides during the Sturgis® Motorcycle Rally™, but be prepared, as this route is full of switchbacks, tight curves and pigtails, all while climbing and descending almost 2,000 feet. While the route can be difficult with hundreds of curves, pigtails and tunnels, you’ll be rewarded with views of Mount Rushmore and by traveling through Custer State Park. From Sturgis, take Hwy 385 to Hill City and follow signage to the Needles Highway; from Rapid City, Highway 16 will lead to Hill City and the Needles destination. The Badlands are one of South Dakota's natural wonders, with striking views, rugged terrain, and rich geological deposits. The 244,000-acre park is like no other place and you won't be disappointed you took the time to visit. Badlands Loop State Scenic Byway (SD 240) is a 31-mile loop through the Badlands that offers views of buttes, cliffs, and the famous multi-colored spires unique to the park. Traveling from Rapid City on Interstate 90, take Exit 110 at Wall and follow the signs to the Pinnacles Entrance. Following SD 240, you'll pass near the town of Interior and arrive at the Ben Reifel Visitor Center.